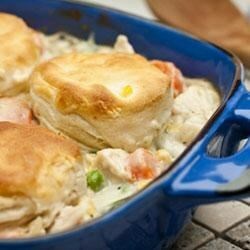 "A creamy chicken and vegetable casserole is topped with flaky, golden biscuits." Mix soups, milk, thyme, black pepper, vegetables and chicken in 3-quart shallow baking dish. Bake at 400 degrees F for 15 minutes. Stir. Arrange cut biscuits over chicken mixture. Bake 15 minutes or until biscuits are golden. *Use a combination of broccoli flowerets, cauliflower flowerets and carrots. A very nice weekday meal. Pretty good. My elderly parents liked it alot because it wasn't spicy.